Nu-Film 17 HAS BEEN DISCONTINUED. SEE RELATED PRODUCTS BELOW FOR SUBSTITUTES. 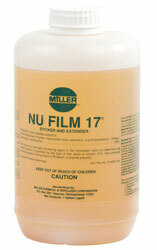 Nu-Film 17 is an Spreader Stickers to Extend Pesticides Superior sticking/extending agent is designed to lengthen the life of foliar-applied insecticides and fungicides. Forms a sticky, elastic film which encapsulates and tenaciously holds the pesticide e on the crop foliage in spite of rainfall, irrigation or wind. Also shields the residue from heat and ultra-violet light degradation. University research shows significant (up to 100%) increase in the duration of biological insecticides such as Bt's. Use at .5-1 pint/acre. When insecticide and fungicide spray applications are made within 30 days of harvest, switch from Nu-Film-17 to Nu-Film-P. Nu-Film-P is a superior sticking agent but does not have the long term extender properties of Nu-Film-17. Use at 4-6 oz/acre. Both products derived from pine. Pesticide I.D.# is required for CA commercial growers. Would you like to see the Nu-Film 17 Label? How about the Nu-Film 17 MSDS sheet?